Tara Moss and her supernaturally-gifted new heroine Pandora English return with the sequel to the bestselling <em>The Blood Countess</em>. The stunning mix of high fashion and gothic intrigue, set on the glamorous streets of New York City, is continued in this compelling new mystery. 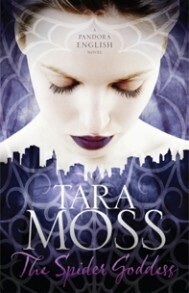 Tara Moss and her supernaturally-gifted new heroine Pandora English return with the sequel to the bestselling The Blood Countess. It’s been two months since Pandora English left her small hometown to live with her mysterious great-aunt in a haunted mansion in Spektor, the fog-wreathed suburb of Manhattan that doesn’t appear on any map. Moss’s unusual supernatural series continues. In a strange Manhattan suburb and in a mansion with her aunt and a dead soldier, Pandora English faces up to her inheritance. Meanwhile, a new designer has ominous ambitions. Fashion has rarely been so haunting. In a word: sinister. Some books have got the ability to capture you… It’s terrific reading. Moss’ writing style made this book a pleasure to read and set my imagination aflutter. Her reinterpretation of classic horror characters separates this book from the others in its genre keeping it fresh and exciting… I can’t wait for the next in the series.